Manet died a week ago today, on April 30, 1883. He was just 51 years old. I used the portrait Carolus-Duran painted of Manet at the top of this post because I like how Manet looks in it. Friend Antonin Proust described Manet as “ouverte et franche,” and I think this portrait shows that side of Manet. I think of Manet every day, but I especially thought of him this past week on the eve and day of his death. Within days of having his leg amputated, he developed a fever, and he died within a week. I don’t know if the operation brought him any relief from the syphilitic symptoms that affected him for years, or even alleviated the pain from his gangrenous leg. I don’t know if he had a peaceful death. I do know that he went on painting almost until the very end of his life. In 1882, Manet completed A Bar at the Folies-Bergère, a painting that measures 38 by 51 inches. He completed the painting even though friend Theodore Duret said that, from 1880 onward, Manet was often “presque cloué sur sa chaise”—almost nailed to his chair from his debilitating symptoms. But Manet’s artistic vision and output continued. He went on painting small bouquets, such as Carnations and Clematis in a Crystal Vase, almost up until his death. 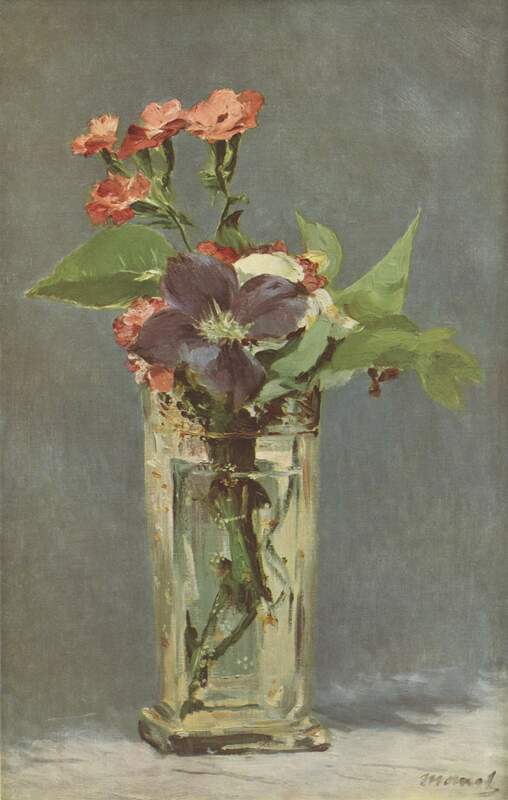 According to The Last Flowers of Manet, he painted up until February of 1883. He painted as long as he could. The thought of him working on the ever-smaller canvases of the bouquets while he was in pain almost breaks my heart many days, but it consoles and gives me strength, too. When I think of what it means to live for art, and to live within art, I think of Manet.